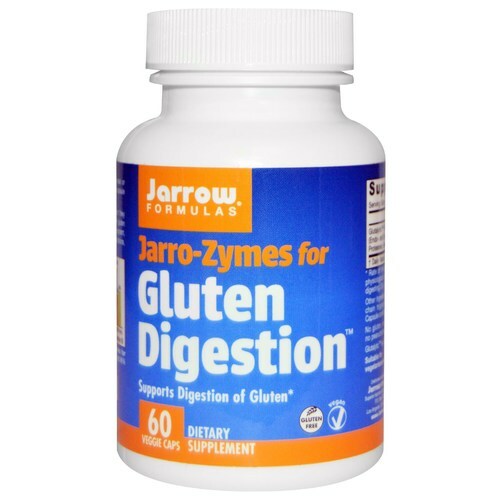 Jarrow Formulas Jarro-Zymes for Gluten Digestion comes in easy to consume vegetarian capsules packed full of a uniquely designed glutalytic enzyme blend. Warnings: Persons with celiac disease or those who suspect they have the condition, should not rely on this product to consume gluten containing foods. If you have a medical condition, are pregnant, lactating, trying to conceive, under the age of 18, or taking medications, consult your healthcare professional before using this product. Keep out of reach of children. Do not take more than recommended dosage. Do not use if safety seal is broken or missing. Notes: Gluten Free. Dairy Free. Egg Free. Fish/shellfish Free. Peanuts/Tree Nuts Free. Recommended Use: Take 1 to 3 capsules before each gluten containing meal or as directed by your qualified healthcare professional. One capsule digests 20 g of gluten within 90 minutes.